Louis XVI ormoulu, tinted silvered bronze and bleu turquin marble pendule à cercles tournants. Two amours symbolizing "Day" and "Night" are seated on clouds below an extremely well engraved terrestrial globe. There are twenty-four separate hour enamels, twelve on a white ground for the daylight hours and twelve on a dark background for the night hours, which rotate counter-clockwise to indicate the hour at any longitude on the globe. Many cartographic features are indicated, such as the prime meridian at Greenwich, the Tropic of Cancer, the Equator and the Arctic Circle. There is a carefully delineated world map, lacking the continent of Australia, which only appears on maps drawn at a later date. A rotating ring above the hours indicates the minutes, with an enamel plaque for every five minutes. The putto symbolizing “Day” holds an arrow pointing upwards to the meridian of Paris for the local time. The figure of “Night” is partially cloaked in a blued silvered bronze mantel sewn with ormoulu stars that obscures part of the globe. The sculptural portion is raised on a finely fluted bleu turquin column, with very thin walls, hung with ormoulu floral swags. The hinged front swag lifts to reveal the unusual single winding hole for both the bell and going trains. 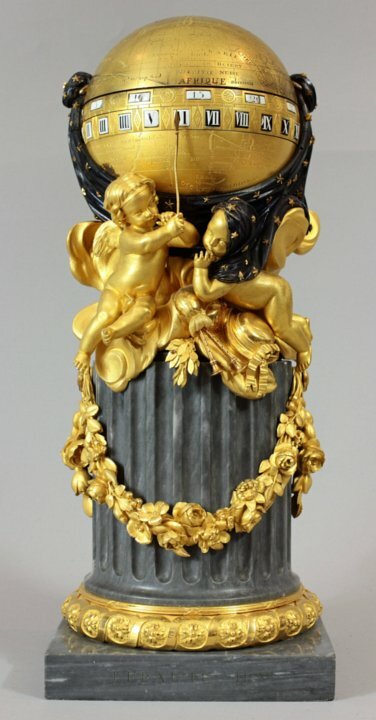 The ormoulu ring at the base of the column is formed of two bands of interlaced ribbons surrounding rosettes; the top of the ribbon in the center is inscribed: “LEPAUTE” for Jean Baptiste Lepaute (1727-1802). The marble base is incised “LEPAUTE Hger”. A plate below the movement inside the column is signed "LEPAUTE HORLOGER DU ROI 1780". There are restorers’ marks scratched onto a plate that supports the movement: the first is by Henry Lepaute (1749-1806), a member of the Lepaute dynasty, who cleaned the clock and documents work done on a pinion in February 1801. The fact that a principal of the company did the work attests to the importance of the clock to the owner and to the Lepaute company. Other work was done by another clockmaker who signed with the initials “EC” in 1820, 1841, 1849, 1856, and 1865. Exhibited: French Clocks in North American Collections. The Frick Collection; New York, 1982. Nº 72, page 81.